This is the story of how I dated three amazing cookies. I searched high and low for them and my standards were high. One main requirement: they had to be unique. Eventually I picked three, and of the three I picked one I love best. So, I broke up with the other two. You're an amazing cookie. Really, you are. Major props to the Byrd Cookie Company for introducing an awesome cupcake flavor into the cookie world. Plus, you look hot in pink and I like how your cream cheese-flavored sugar topping is cool on the tongue. The flavor comes close to the real thing. But why are you so tiny?? I would love to see a bigger, freshly-baked version of you one day that's soft and chewy--then maybe I won't feel bad for shelling out $7/box. You had me going there. You look more chocolate-y than you actually are. But you make up for it with generous servings of walnuts. Though I had my doubts because you're made with egg whites, I really like how your flaky shell crumbles in my mouth. Your sweetness is subtle. I could've used a little more. You're kinda like that cocky boyfriend who plays it cool in public but secretly turns into mush inside. Not bad, not spectacular. Hello crispy cornflakes and melted marshmallows! You're not exactly the most gorgeous cookie around but we all know looks are deceiving. I love how you're all at once, salty, sweet, crunchy and chewy. Even though I don't want to think about how much butter went into making you, I give Momofuku two thumbs way up for creativity. 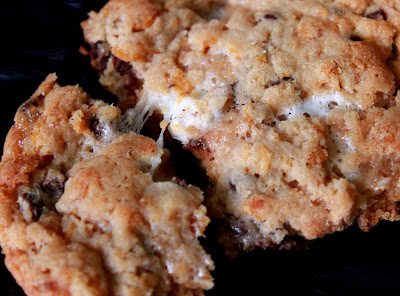 Cornflake-Marshmallow Chocolate-Chip Cookie, you had me at hello. XOXO.